Speaker, 7th KLA from 24-06-1982 to 28-12-1984 and 11th KLA from 06-06-2001 to 04-09-2004. 7th KLA [Attingal-INC(I)] (Resigned the membership on 28 December 1984), 11th KLA [Attingal-INC]. M.A., LLB; Advocate; Son of Shri Bhanu Panicker and Smt. Bhavani; born on 12 April 1928; Wife: Dr. Lily Purushothaman; 2 Sons, 1 Daughter . Minister for Finance and Excise since 05-09-2004. 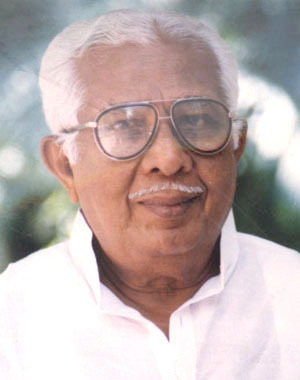 Lieutenant Governor, Andaman & Nicobar Islands (19-3-1993 to18-3-1996). Member, Lok Sabha (1984-89) & (1989-91). Chairman, Committee on Public Undertakings (Lok Sabha), Committee on Subordinate Legislation (Lok Sabha). Syndicate Member, Kerala University; Started political life as a worker of Students Congress in 1946; Became a Member of Vakkom Panchayath in 1953; President, D.C.C., Thiruvananthapuram; General Secretary, K.P.C.C. ; Vice President, K.P.C.C. ; A.I.C.C. Member for 25 years; Chairman of the consultative committee of experts to the CIDP of Inter Parliamentary Union, Geneva for 5 years, Delegate to the Commonwealth Parliamentary Conference held at Bahamas in 1982, Nairobi in 1983, Isle of Man in 1984, and Australia in 2001; Leader, Indian Delegation to the Global Conference on the sustainable development of Small Island Developing States (Barbadose 1996).